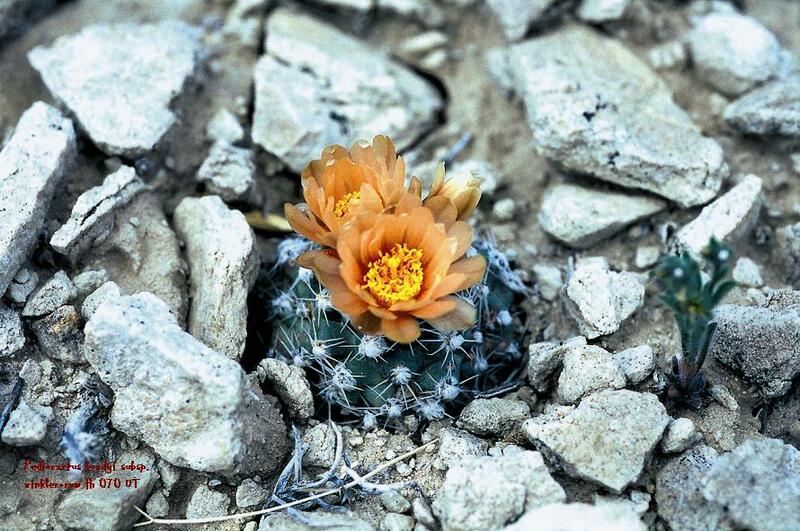 The Genera Pediocactus, Navajoa, Toumeya 61. 1995 ("winkleri"). Pediocactus winklerorum Heil Three new species of Cactaceae from southeastern Utah Cact. Succ. J. (US) 51(1) 28-30. 1979 ("winkleri"). Pediocactus bradyi Benson var. winklerorum (Heil) Hochstätter Aucculenta 73 (2): 55. 1994 ("winkleri"). Pediocactus simpsonii (Engelmann) Britton & Rose) ssp. winklerorum (Benson) Halda A new System of the genus Pediocactus Britton & Rose Acta Musei Richnoviensis, sect natur 5(1): 14(june) 2000 (dated erroneously as 1998) ("winkleri"). Puebloa bradyi (Benson) Doweld var. winklerorum (Heil) Doweld Puebloa, a new genus of Cactaceae Juss., Sukkulenty 2(1) (numbered as 1/2): 22. (25 Jul) 1999 ("winkleri"). Type: USA, Utah, Wayne County, S of San Rafael Swell; 5 Apr 1977, K. D. Heil s.n. (UNM 64285, holo., 64287, iso.). Note that the protologue states that this plant was discovered by Mrs. Agnes Winkler und her son Jim. The original spelling therefore is grammaticly incorrect and has to be corrected. (In : The Genera Pediocactus, Navajoa, Toumeya Hochstätter 2007, page 16). Representatives material studied: Utah: fh 070, fh 070.0, fh 070.1, fh 070.2. Pediocactus bradyi subsp. winklerorum is endangered and is included in Appendix 1 of the Washington Agreement on the Protection of Endangered Species. Body solitary, sometimes clustering, spherical to globular to obovoid 3.5-7 cm long, 2.5-5 cm wide, tap root, repeatedly branched, mimicry species, in common with th other subspecies , characteristically shrinking into the ground during dormancy. Flowers appearing irregularly around the apex, generally 1-4, 1.5-2.2 cm long, 1.5-3 cm in diameter, salmon-coloured, pale to deep pin, cream to greenish. Flowering period. April to May. Utah. At 1,450 -1,650 m altitude. Associated with Sclerocactus wrightiae, Sclerocactus parviflorus, Echinocereus triglochidiatus, Opuntia polyacantha, and Yucca species. Endemic. The name of this taxon was chosen in honour of its discoverers, Mrs. Winkler and her son Jim.